Hello Stamping Friends! Welcome to our very last 2017 Stampin' Up! 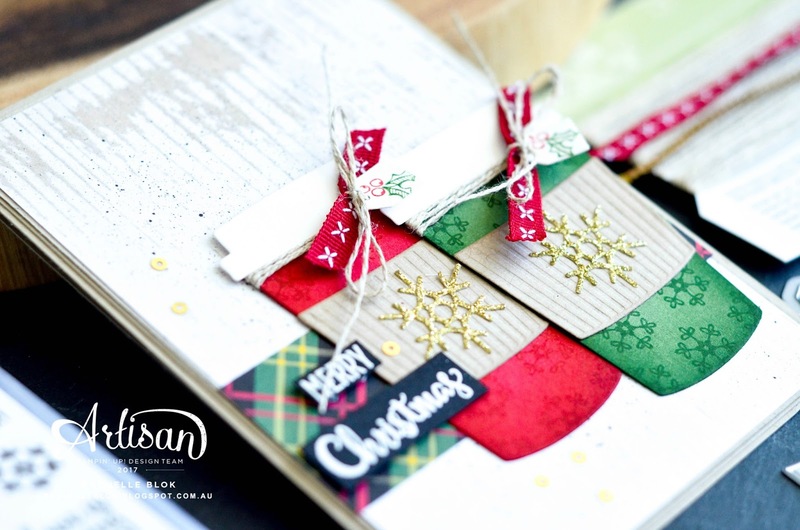 Artisan Design Team Blog Hop for December and for the year. I can't believe we are at our last post already! It feels just like yesterday when this amazing journey began. While this year has been at times a little crazy I have truly loved every minute of it and still cant believe that I was give this opportunity of a life time. I am so very grateful for everything that this team has brought. Also a big thank you to all of you who have supported me along the way! I'm a bit sad that this Artisan year has come to an end I'm super happy for those that have been selected for 2018. These creative and talented ladies are amazing and I'm sure they will inspire you as much as what they do me. Check out the list at the end of this for the 2018 team and go and show them your support. Now on to my card for today, we are using the Merry Cafe Stamp Set and I'm going out with one of my final (I think it is) Christmas Cards for the year. Its such a cute and fun set and covers everything from Halloween to Christmas and everything in between. 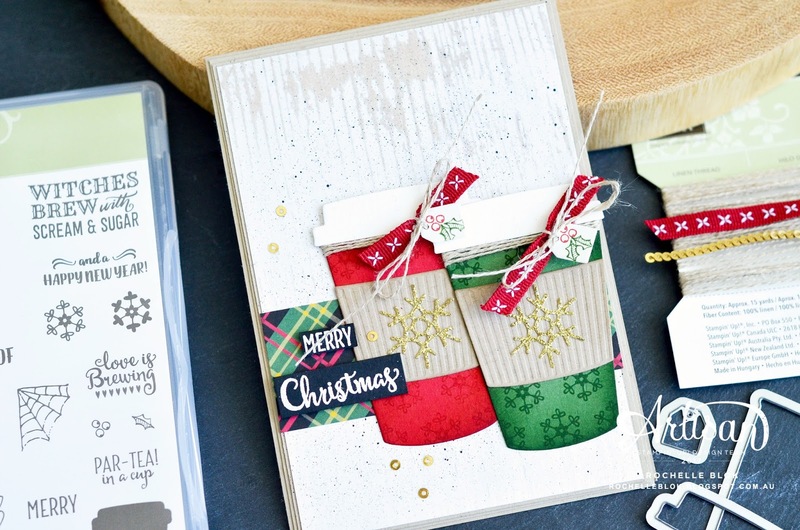 I've created a fun Christmas Coffee Cup making it look like the fun decorated ones from the popular coffee stores sticking with the traditional Red and Green colours for that Christmassy look. I've gone for that tone on tone look with the coffee cups stamping Real Red on the Real Red cardstock and then Garden Green on the Garden Green cardstock. I've then sponged around the edges in each co-ordinating colour for some added dimension. The great thing about this stamp set is that it has matching Framelits from the Annual Catalogue, the Coffee Cups Framelits Dies. Loving the textured coffee cup collar for that added layer and element. On the collar I've added more of that Christmas by die cutting a Gold Glimmer snowflake from the Seasonal Layers Thinlits Dies. I know for sure that I would love a gorgeous coffee cup like this when I get my coffee. So cute! The coffee cups have been layered on a piece of Christmas Around the World Designer Series Paper that is layered on the Wood Textures Designer Series Paper. Its all finished off with some Linen Thread, Cherry Cobbler 1/4" Double-Stitched Ribbon and some sequins from the Mini Sequin Trim. Now for the last time this year on to the amazing Shannon Lane in Canada for her fabulous Merry Cafe creation! And now here is the complete list of 2018 Artisans. Make sure you visit their blogs and subscribe! You won’t want to miss their amazing creations! A whole lot of talent right there that's for sure! You have ended an amazing year the same way you started it - with a bang (and gorgeous project!)! It has been a pleasure working with you Rochelle. I always love tone on tone. And two coffees are always better than one. I am drinking coffee as we speak!! Thanks for being awesome and positive. Love you and your projects! Thanks for a year full of jaw droppingly gorgeous projects Rochelle! Your creavity never ceases to inspire and amaze. Sorry to see you and this talented Artisan team wrapping up for the year... but congratulations on Fancy Friday!! Looking forward to getting to see more of your beautiful work next year. Fabulous card! I lov your projects to! And I am glad that I was able to get to know you!